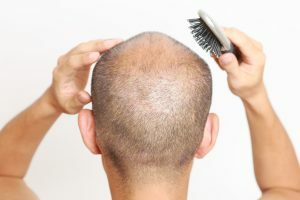 There is a typical pattern of hair thinning that historically can cause gradual men’s baldness. This is a dominant hereditary trait and is a gradual pattern of hair thinning. Pattern hair thinning is not actual hair loss. Hair loss is related to health, the hair cell and the hair cycle. Treating hair loss as pattern thinning will not deliver a result. Hair loss related to the hair cycle is diffuse, all over the scalp. Diffuse hair loss can expose pattern hair thinning that was happening gradually in the background. Pattern hair thinning occurs at the top, front, recessions and crown of the head. Typically, men experiencing hair loss misinterpret if for the pattern hair thinning because its right there in front of your eyes. Checking in on the terminal area away from pattern hair thinning locations can uncover the reality of the problem. Changes in the body, highs, lows, illness, medications, surgery and much more, can trigger hair loss three months after the event. Finding the cause is the key. If hair loss has uncovered pattern hair thinning there are simple things that can be introduced, but, won’t work if the cause of the hair loss is left uncovered or unattended.